There's no easier way for analyzing vehicle swept paths online. Start simulating vehicle turning paths online from any PC or Mac with an internet connection. With AutoTURN Online, there’s nothing to install. 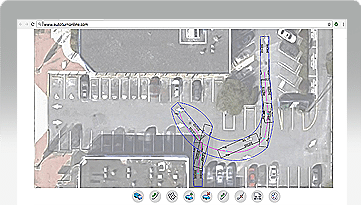 Just the vehicles and tools you need to analyze swept paths in seconds – done all through your browser! Analyze Anytime and Anywhere Analyze Anytime and Anywhere AutoTURN Online provides users with a quick and reliable solution for performing forward and reverse vehicle swept path turning maneuvers to evaluate vehicle access on a variety of projects. 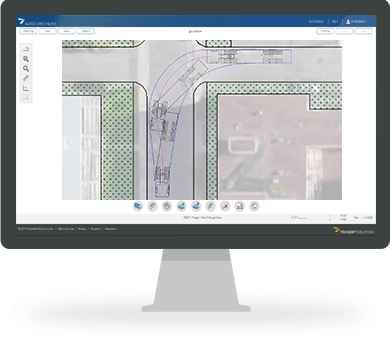 AutoTURN Online provides users with a quick and reliable solution for performing forward and reverse vehicle swept path turning maneuvers to evaluate vehicle access on a variety of projects. https://www.transoftsolutions.com/wp-content/uploads/2017/03/ATO_featureimages_import2_0217.jpg Overview EXPORT SIMULATIONS Import a dxf file from your project to AutoTURN online, evaluate one or multiple turn simulations and export a dxf file of the simulations that you can import back into your CAD platform. 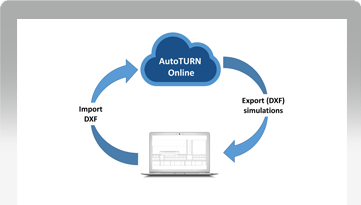 Import a dxf file from your project to AutoTURN online, evaluate one or multiple turn simulations and export a dxf file of the simulations that you can import back into your CAD platform. https://www.transoftsolutions.com/wp-content/uploads/2017/03/ATO_featureimages_forward_0217.jpg Overview MODEL COMPLEX SIMULATIONS Perform forward and reverse simulations for different design vehicles. When generating forward simulations control the speed, superelevation and friction for each section of the simulation. Perform forward and reverse simulations for different design vehicles. When generating forward simulations control the speed, superelevation and friction for each section of the simulation.